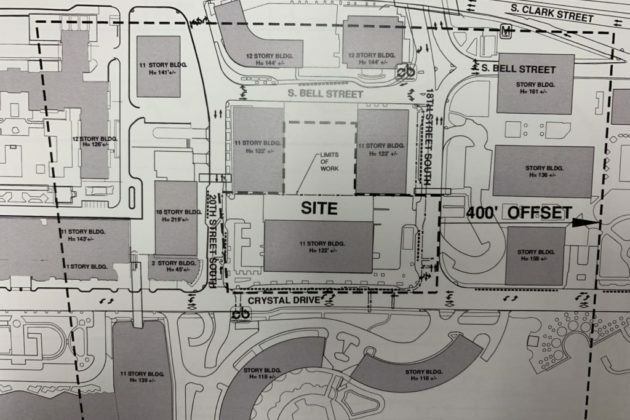 JBG Smith’s plans for a redevelopment at 1900 Crystal Drive. A rendering of the site at 1900 Crystal Drive in Crystal City. A map of the site at 1900 Crystal Drive in Crystal City. 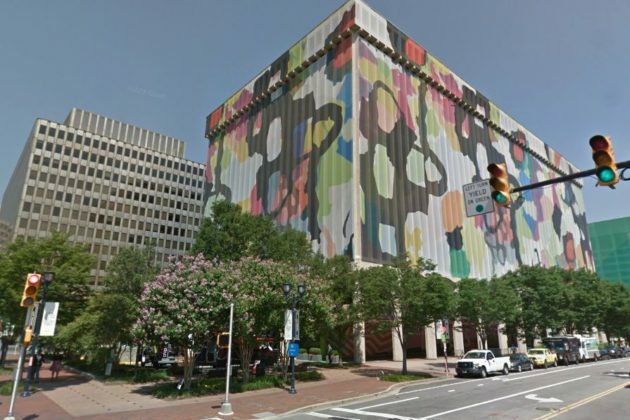 JBG Smith is starting to sketch out its plans for a major redevelopment of a Crystal City property that will drop hundreds of new apartments and thousands of square feet of retail space directly adjacent to some of Amazon’s new office space in the area. The developer has now filed preliminary plans with the county detailing the future of a vacant office building at 1900 Crystal Drive. 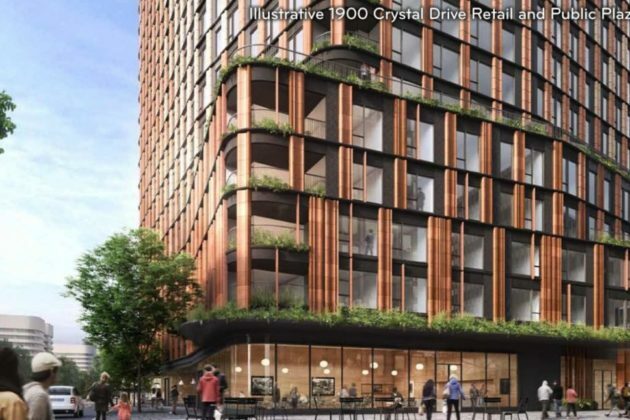 The company has already started some demolition work for the current structure, and previously announced plans to build two new mixed-use buildings in its place, accelerating the project now that Amazon is on the way. The tech giant plans to lease space at two of JBG’s properties on the same block, buildings at 241 18th Street S. and 1800 S. Bell Street, so this new development could offer Amazon workers with apartments within easy walking distance of the new headquarters. 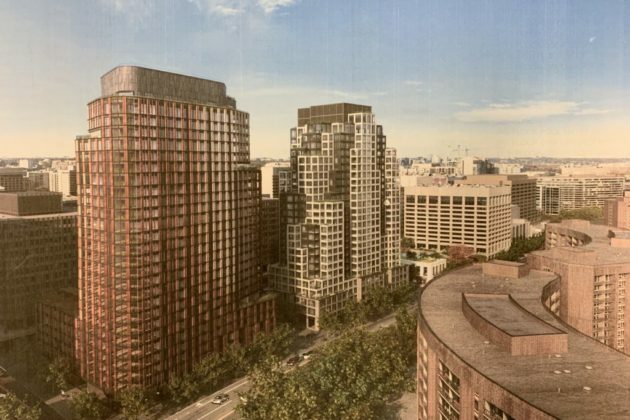 Developers throughout the area have been racing to build new housing across Pentagon City and Crystal City since the company announced its plans in mid-November, though the neighborhoods do have slightly higher than average residential vacancy rates, for now. JBG kicked off the redevelopment process in earnest in late January, asking for a slew of county zoning changes and a “site plan amendment” to key the full redevelopment of the block. The plans call for the construction of two large towers, holding a total of 790 apartments. One will be 26 stories tall, the other 25 stories. 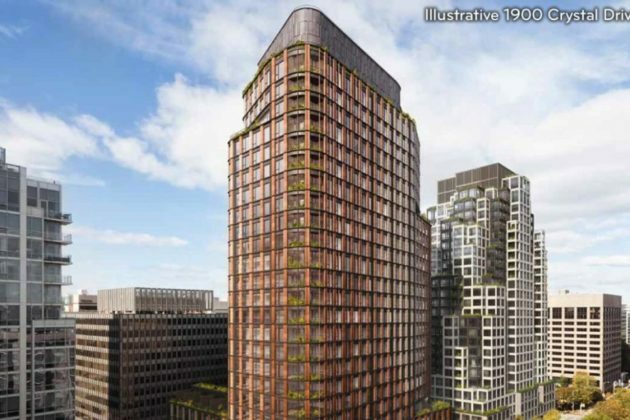 Each one will also have space for ground floor retail: 19,390 square feet of space in one tower and 16,800 square feet in the other, according to documents filed with the county. The developer is envisioning a “pedestrian plaza” in between the two buildings, with room for just under 9,000 square feet of retail in the plaza. 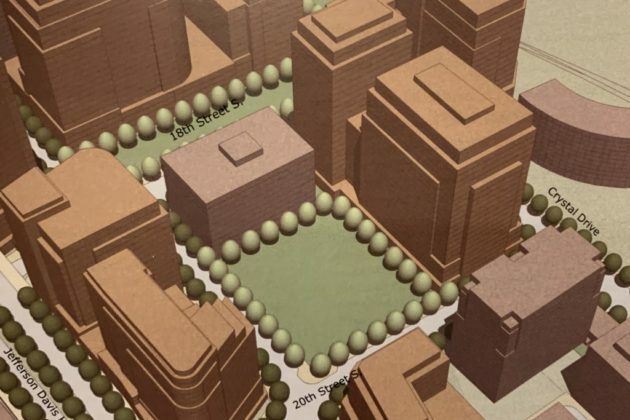 The plans even allow for a park to be built nearby, though the documents don’t specify where, exactly, it will be located on the block — but if it is built, a “grand staircase” will connect it to the pedestrian plaza. When it comes to parking, JBG plans to partially rely on the existing underground garage on the site. The developer plans to demolish part of the garage, but leave 306 spaces unchanged. Then, it hopes to add a new section of the garage with 290 new spaces for a total of 596 available in all. The project is a long way from being approved, however — the county’s Site Plan Review Committee will now scrutinize these plans, before they head to the Planning Commission and County Board. Vornado/Charles E. Smith previously secured permission to build a 24-story building on the property, but that approval lapsed in 2015. The company spun off its local property holdings in a merger with JBG the next year. This is far from the last redevelopment JBG is planning in the neighborhood in the coming years. In addition to its large “Central District” project (bringing a new movie theater, grocery store and office space to the area), the company previously told its investors that it could look to redevelop properties including 2001 Jefferson Davis Highway, 223 23rd Street S., 101 12th Street S., and the RiverHouse Apartments (1400 S. Joyce Street). Though JBG is by far the largest property owner in the area — controlling about 71 percent of the market’s office buildings — county officials hope other landlords take similar steps to refresh nearby buildings. As for Amazon itself, the company won’t file any plans with the county until the Board signs off an incentive package to formally bring the headquarters to the area. The Board won’t take up that issue any earlier than March.